Wyndham Harbour – A Precursor to How the West Might be Won? Today Minister Matthew Guy has announced the rezoning of a significant 10.37 hectare parcel of land in Wyndham City, Werribee in Melbourne’s west, facing onto Wyndham Harbour and Port Phillip Bay. This signals a boost in confidence from the State Government and a clear commitment to encourage infrastructure and development within Melbourne’s west. “Clearly rezoning the land is a statement of intent to deliver a critical mass of people, a viable population catchment and a thriving seaside community to service a proposed new Port Phillip ferry,” commented Lyons’ CEO, John Roysmith. It is envisioned that Wyndham Harbour will become a thriving, focal hub within Melbourne’s west. 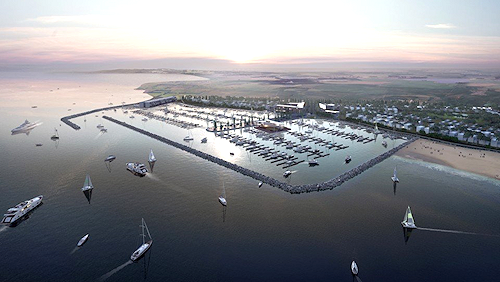 Wyndham Harbour will eventually become home to Victoria’s largest luxury marina, providing up to 1000 berths as well as incorporating a stylish master planned residential and retail precinct set to include an exciting combination of cafes, restaurants and specialty stores. Amenity aplenty will be provided along the Wyndham Harbour boardwalk, with 390 car parks, a marina club and a proposed new Port Phillip ferry service. This vibrant coastal community will help provide much needed infrastructure and amenity for City of Wyndham, identified as one of the fastest growing local government areas in Melbourne. By 2026, over 20 per cent of Melbourne’s 900,000 expected additional residents are projected to reside in Melbourne’s west, as the west is forecast to almost double in population. Significant growth has been forecast to continue within the western corridor. Also under construction at Wyndham Harbour is an apartment building designed by Fender Katsalidis Mirams containing 104 apartments (sold out), and a second five level apartment building designed by SJB architects containing 140 apartments is due for release later this year. The last paragraph above is of particular interest – the supply of 244 apartments into an area flush with detached housing. That stage one has sold out speaks volumes about individuals’ ever increasing propensity to choose apartment living over the traditional house/land package, even on Melbourne’s fringe. Caroline Springs is a prime example. It contains multiple apartment buildings up to nine levels at all stages of development. Apartments on the fringe – absolutely! Given appropriate transport links (i.e. the pending Melbourne-Werribee ferry service and adequate rail services) the option of higher density living around activity centres/transport nodes should always be preferred, regardless of the location. This would decrease vehicle trips, alleviate stresses on Melbourne’s already overburdened transport infrastructure whilst also providing essential services and amenity within a shorter distance to a greater number of people. For example, Joe Blow lives in Werribee close to both Wyndham Harbour and the Princes Highway, and commutes to Melbourne for work. He could walk to a fast ferry terminal, jump on a train for Melbourne’s CBD or alternatively continue to drive his car every morning into the rolling car park that is the Westgate Freeway. Things must change before the urban errors that are Derrimut and Truganina (close to Wyndham Harbour) are replicated elsewhere in Melbourne’s west. Truganina is a depressing excuse of a hole; no transport links, no amenity, no services, no entertainment/retail offerings… and no hope. Suburbs such as these that provide no stimulus are breeding grounds for social problems. I know, I’ve had the misfortune of working there many times over. Now some may say I’m completely wrong, but luckily Wyndham Council is not amongst them. Above is Wyndham City Council’s vision for Werribee and Bird de la Couer’s Alamanda Point Cook project. 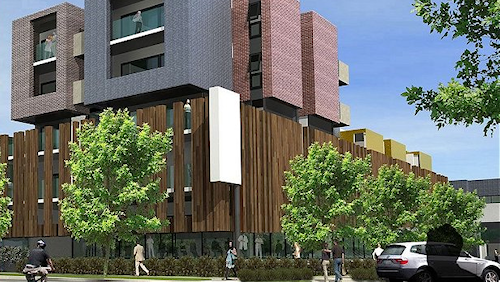 Clearly, in due course, apartment living will become far more prevalent in Melbourne’s west, as it should. Given there’s only one auto crossing over the Yarra to Melbourne’s west for the foreseeable future, high density housing options around transport hubs/activity centres is a highly efficient way to tackle a multitude of urban blunders that exist on the western fringe. The pace of urbanisation in these areas is highly dependent upon the correct implementation/realisation of mass use transport infrastructure projects, and seeing the Melbourne-Werribee ferry come to fruition would be a great start. And one more request while I’m at it. If the green field sites in the Wyndham Harbour image are to be developed in the future, a nice mix of midrise buildings punctuated by open spaces would be the ticket. Rare Parcel of Land in Inner West Up For Sale West Footscray is On The Move in a Big Way Port Melbourne Style What’s Driving Property Values? East West Link – How Much Will Residents Be Compensated? 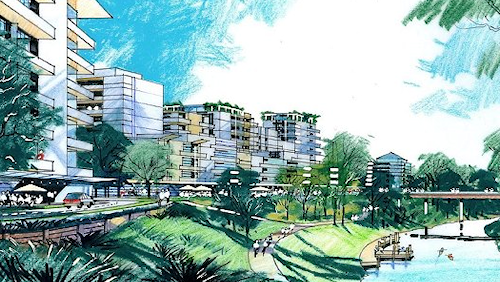 Street Talk > Wyndham Harbour – A Precursor to How the West Might be Won?